We all have a romantic image of driving on a dusty road in the American West in a beat-up old pickup truck, the kind with an AM radio and an old woven Navajo blanket over the seat. Weirdly, the modern vehicle most analogous to a 1960 Dodge Powerwagon with rusty bumpers or a 1980 Chevy Silverado with a gun rack and an old yellow dog named “Butch” may be a Russian-built Ural sidecar rig. That’s because the Ural is based on an ancient design—the BMW R71 from before World War II, and IMZ-Ural, along with a few other companies, has been building it for 72 years. And you thought the Suzuki DR650 was old. But there’s a reason it’s been built and sold for so long besides the fact it came from a centrally planned economy—it’s not only reliable, simple and easy to repair, the extra traction offered by the selectable driven sidecar wheel offers cheap, dependable transportation no matter where you live, from Mojave to Mongolia. Mechanically, the Gaucho is the same as the Patrol. That model uses a 749cc air-cooled Boxer Twin that’s rated at 40 horsepower. The frame and chassis numbers are purpose-built for the sidecar, and there’s a lever to switch from one to two-wheel drive. Although it’s built in Russia, it uses a host of high-quality components from Germany, Japan and Italy like Brembo brake calipers, Keihin carburetors and Sachs suspension to enhance performance and reliability. All in, the rig weighs a claimed 705 pounds with the 5-gallon tank empty. Ural doesn’t want to pander to hipsters anway—”marketing to trends is dangerous.” Ural wants permanent customers, so it markets to “movements or shared markets” like ranchers and outdoor enthusiasts. 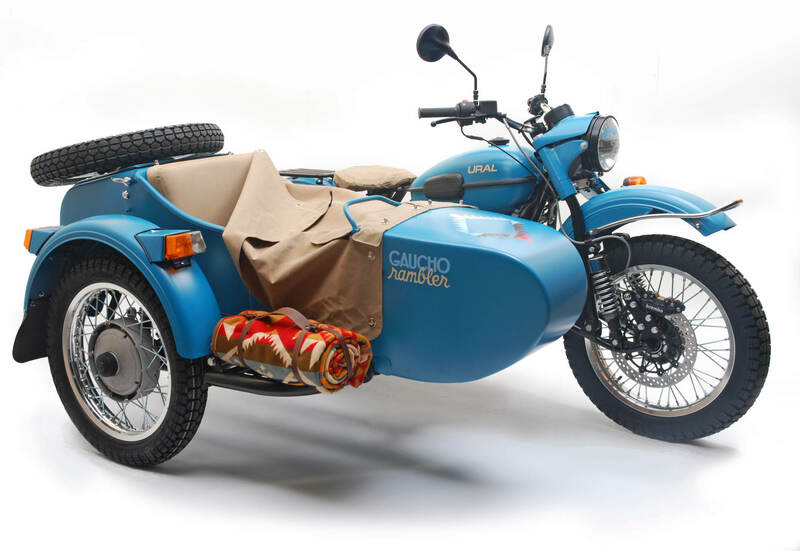 In some ways, it seems like an odd fit, a WWII Soviet sidecar outfit living out its days as a sheepdog on a cattle ranch, but if I had to choose between driving an old Dodge or a sidecar hack, you know how I’d answer. More Info on the Gaucho Rambler here. Wonder if a /7 Beemer engine would fit? There goes the FI and warranty though. I’ve always wanted to do what this bike is kinda intended. I haven’t ridden my old R100 for a few years. I’ve always threatened to put a sidecar on it. I know Americans always want faster, tougher, appliance laden and that’s what my monstrosity would be, a Ural that could be cruised at modern speeds all day. Unfortunately no driven hack wheel and reverse. to be fair, this has the same performance as a Harley. Harley owners don’t complain much. Put a chair on the side of a Soft Tail and it will be neck to neck. A Harley from the 1940s perhaps. Even an 883 Sportster will smoke the Ural. Nope. Ural is a “hipster” motorcycle in itself. early 90s for “hipster” uses. It cost just one salary. It was M-72. But granpa finally refused to sold it. Without that thing on the right of cause. You really think an 883 will smoke this? I’m not sure an 883 would smoke anything. It has the worst power to weight ratio out of all motorcycles. 40hp and close to 600 lbs makes acceleration terribly lethargic. The Ural solo is 40hp and around 460 lb meaning it will smoke the 883! I can’t imagine how bad a Sportster would be with a sidecar! Having ridden a rented 883 side by side with an unhitched Ural, I can assure you it will smoke the Ural. It’s not even close. Can you say torque. The Ural has 38 ft/lbs, the 883 has 55 ft/lbs. I’d put my money on the Harley every time. It’s not all about horsepower you know. Some of you people should actually ride motorcycles, instead of just trolling news releases for an excuse to make “whitty” comments. It really is an exhilarating sport…you should give it a shot. I have to ask. Why by 7 BMW’s if they were something to complain about? Most would have stopped buying after the first. I’m not being pro or anti BMW, I really am just curious. I’ve had 6 BMWs. I don’t understand what sort of problems you could be having. Yes, my valves have receded on my R75/5 but that is a fault of modern gas and me riding with the throttle wide open most of the time. Otherwise, they have been the most reliable bikes I have ever known – especially my K75S. Sorry james but the Ural I reported to be on its second engine and third transmission is less than two years old. Its great your bike has been reliable but even modern Urals are a crap shoot, some are not as good as yours. BMW builds junk, But a third world BMW knock-off, Now that is a bike that I can bring home to momma. Does it have a catalytic converter? Why can’t it be built with modern reliability and power? I would love to have a Ural, would buy a 2007 or newer. You have to realize what its limitations are and not try and make it into something that it isn’t, similar to an Enfield. Saw some Urals a few years back at the International Motorcycle show in San Mateo and in person they look really cool. Really, really cool. I don’t think I’d like the crap power output or the centrifugal rotation when revving the engine, but I could probably overlook those for a much different motorcycle experience. Thumbs up. When the Ural hacks first came to this USA to be sold they were $4,995. This is before any improvements had been put on them. My understanding about them then is that the motors were never made to be used on paved roads and therefore were not designed internally for a constant speed like used on our paved roads. The motors were designed for stop/going movements @ maybe 45 mph. Unless the internals have been beefed up, the oiling problem is at a constant speed the oil doesn’t get thrown all over to where it’s needed, so the motor self destructs. If this weakness hasn’t been changed, buyer beware. I suppose on dirt roads and all terrain riding, the motor is in it’s happy place. I saw pics of a Ural Rally and most everyone there trailered their Ural to the campground and then rode them as a group to different sights for seeing unusual buildings, etc. The problems are all quality control issues compounded by the fact that it is an ancient design. The motor is designed to stop and go just like any other. It just doesn’t do a very good job with the “go” part of that equation. Riding at highway speeds here means keeping the engine close to its redline. Mix high stress and garbage parts for any length of time, and stuff just starts breaking. Keep the looks, but improve the mechanics and performance. Then Ural wouldn’t have to go pandering into the outback and woods to look for permanent customers or a limited niche market. Why is this so hard for a modern company to do, one located even in Russia? If you can build nuclear subs and missiles, modern, state of the art fighter jets and tanks, then why can’t you build a bike with just little added effort that goes faster than 60 mph, in this modern age? What kind of tank could you build for $14,000? Just saying! For 14K, a tank? Not much of one. But a bike that can go faster than 60 mph? That’s different story. If the Russians can’t do it, then surely there must be some disaffected and disenchanted, alcoholic engineers in Japan, with some free time on their hands, who could be enticed by the promise of free vodka and a couple of over friendly Olgas here and there to spend of few months in mother Russia to help them accomplish this relatively simple task. Interesting question. I don’t know the answer. But even in 60’s there where Vostoks racing bikes. Funny. It was 40 years ago when I watched this thing the first time and it remains the same (Ops, Led Zeppelin(c)). Now this bikes are only for export and previous times there where thousands of them. We’ve had local riders using Urals for a long time now. It is truly amazing what some people can do on these machines. As for me. I really don’t think that I would want to get a side car rig running much past 50 mph. Honestly I see this a a retirement bike. One that I could use on the back roads that it was designed for. One that could take me and my pup to the coffee house and home again just in time for my nap. I’ve always liked the way Urals look. I still wish BMW would make a retro bike. Urals are funky, clunky and bit junky. I’ve been following their progress over the past 10 years or so, mainly through their owners’ forum. It appears the factory has been working pretty hard, especially over the last 5 or so years, to improve the reliability. From what I read on the forum, it’s been working. So, I wouldn’t buy one older than 5 years, unless I knew what I was getting into. Another factor Ural owners live with is the travel delays they run into whenever they stop for gas, or sometimes even at a stop light. Someone always wants to talk to them about the bikes, and almost always they’re assuming the bikes are vintage BMWs. Apparently it can become a real issue for them at times. Then again, if you’re in a hurry, I suppose you’re on the wrong machine. With a top speed of 60-70 mph, the cruising speed is usually in the 40-50 range. If you read some of the journals of people who tour the country, even the world on these things, that can translate into some pretty exciting times, even on back roads. In principle I like these … except they won’t go much over 50mph without sounding like they are about to explode, and the only guy I know who owns one is a millwright and has to make improved parts for the bits that keep breaking. That said, he does ride it year round in Canada, and uses it to take his blind dog for rides. I however would never own one. 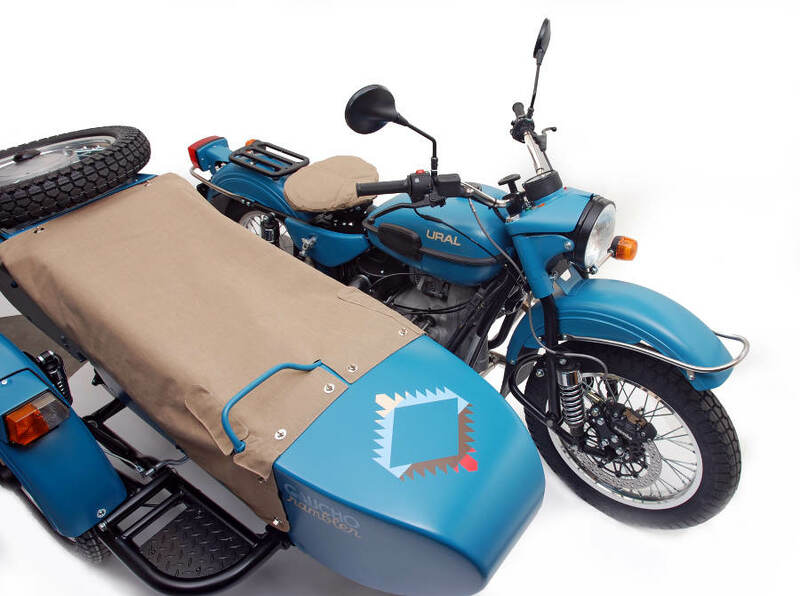 … but the special edition with baby blue paint and a blanket does not scream “motorcycle”. Finally, a way for me to get a Pendelton blanket. Pendleton Woolen Mills does not “put on” the Pendleton Roundup. In fact, they don’t appear to have been a major sponsor of this year’s event. The Roundup is incorporated as a non-profit and the event dates to 1910. Funny, That’s mighty South West of you. Are you hinting that Suzuki still has some space for improvement in styling? +1 Urals are all the motorcycle anyone will ever need, need is relative anyway, you should consider it a luxery and be grateful that you are not walking. I always though Urals were cool in a “I’m so cool I don’t need to try” way. Unfortunately, I have friends who bought one a few years ago, my image of the brand is not so good these days. They absolutely love their rig. That is really important because they are on (if I have this right) their third transmission and second engine. This is in addition to many minor problems. Reliable? Not even close. Fix it by the side of the road with a rock and sharp stick? How do you fix castings so porous oil goes right through them (and on to the clutch)? Maybe the sidecar is really so you can bring a friend to help push when it breaks down on the road. Yuck! The ultimate poser motorcycle. 1 percenters will keep one of these in the garage at their second (or third) home in Santa Fe or Tahoe. They won’t actually ride it (and, being a fossil, it wouldn’t start anyway, with such intermittent usage). It might get towed to a Sundance catalog photo shoot every now and then. Eventually it will be destroyed when a wildfire sweeps up that canyon and torches the custom 6000 sq ft “log cabin” the owners forgot they owned. Adios hideous bike. I am curious. Just what does one have to ride to NOT be a poser? So far on this site, I’ve gathered that it can’t be a cruiser, a sportbike, an adventure bike, a scooter, a Can-Am anything retor-styled, anything that makes more than 50hp, anything that costs more than $10,000, or anything with electrical technology that eclipses the magneto. Now ya know. Do something about it! I’d like it if the P-word was just eliminated here. I love it. Kinda funky. Kinda weird. All good qualities to be found in a bike or rig. It should be OD Green. If I had one of these as a second bike, I wouldn’t need a car. According to the Ural web site, they’re only building 50 units for the U.S. This is anti-thesis to motorcycle; literally. One has to wonder how at this age anyone will be interested in such creature. But, practical it is, that’s quite possible. Purely on technical side of it, I have some appreciation of that front suspension. It was tried and proven long time back and it worked well. And I’ve always had a soft spot for these bikes(Urals). Harley thinks they have the market on retro?